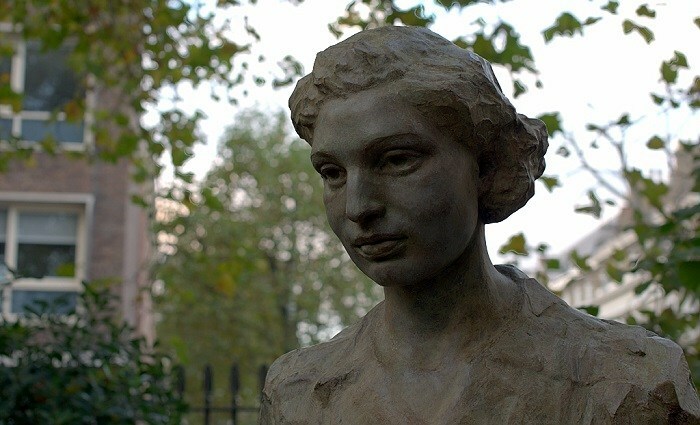 Noor Inayat Khan was a British spy and Special Operations Executive (SOE) agent who worked in Nazi-occupied France during World War II, and was captured and executed at just 30 years of age. She was also the first female radio operator to work undercover in France, relaying messages to the Allied forces, co-ordinating crucial missions and saving countless lives. Betrayal by a double agent led to her captivity by the Gestapo (German secret police). Even in captivity and torture, she did not reveal a shred of information to her Nazi oppressors. Khan was a princess, a direct descendant of the Indian princely state ruler, Tipu Sultan. A firm believer in the principle of non-violence taught under Sufism (a mystical form of Islam), Khan overcame her physical shortcomings and fear of weapons to train as a spy and fight fascism. Posthumously, both Britain and France accorded several honours and awards to her. Noor-un-Nissa Inayat Khan was born on 1 January 1914 in Moscow, where her father, Inayat Khan, a musician and teacher of Sufism, was performing with his group, the Royal Musicians of Hindustan. Inayat Khan belonged to a noble Indian Muslim family; his mother being a descendant of the 18th century ruler of Mysore, Tipu Sultan. Noor’s mother was Ameena Begum (née Ora Ray Baker), an American. 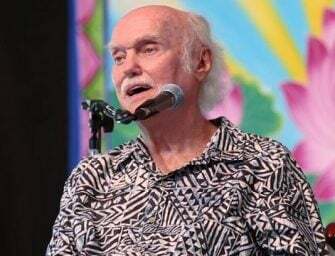 Noor’s parents met in San Francisco, where her father was giving a lecture on Sufism. Noor was the eldest of four children; she had two brothers, Vilayat and Hidayat, and a sister, Khair-un-Nissa. During World War I, the family moved to London, where her siblings were born in London and she attended nursery at Notting Hill. In 1920, the family relocated and settled into ‘Fazal Manzil’ in Suresnes, Paris. Tragedy struck the Khan family in 1927, when Inayat Khan passed away while on a pilgrimage in India. With her mother incapacitated by grief, the responsibility of the household and her siblings fell on the young shoulders of Noor, who just 13 at that time. From a young age, Noor enjoyed writing short stories and poems, or playing the veena and the harp. She pursued a course in music at École Normale de Musique de Paris and child psychology at the Sorbonne. She also wrote short stories for children’s magazines and Radio Paris. At 25 years of age, Noor published her first book of children’s stories ‘Twenty Jataka Tales’ in London. But the peaceful pace of Noor’s life was abruptly disturbed in 1940, with the start of World War II. She lost her family home when Germany invaded France and the entire Khan clan had to escape to London. 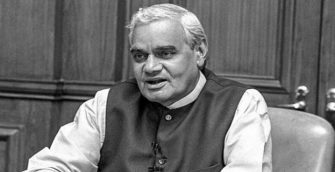 As a Sufi and a follower of Gandhi, Noor was a complete believer in non-violence and a staunch supporter of the Indian Independence efforts against British colonial rule. But her determination to fight fascism led her to join the Allied forces by volunteering for the Women’s Auxiliary Air Force (WAAF) in November 1940. At WAAF, Noor was sent for wireless operator training and then onto bomber training school. Though she was making swift progress in the wireless operator training, Noor felt that she needed to contribute to the war efforts in an active manner, which led her to seek a transfer elsewhere within the British forces. In 1942, Noor was recruited by the SOE (Special Operations Executive – an underground espionage and sabotage task-force setup by Britain’s then Prime Minister Winston Churchill) At that time, SOE’s F (France) section was facing a severe shortage of agents with the exact skill-set combination of fluent French and accurate wireless operator abilities. The job of an SOE-F section agent was also regarded as highly dangerous, with the risk of capture by the Gestapo within the first six weeks quite imminent. Noor Inayat Khan fit the required bill almost perfectly, and was posted to various divisions for further training, including the Air Ministry and FANY (First Aid Nursing Yeomanry). For special training as a wireless operator in enemy territory, she was sent first to Wanborough Manor in Surrey, then to Aylesbury and finally to Beaulieu, where she trained with many other agents. Her slight build and mild manners were not suitable for the immensely tough SOE training. During mock-Gestapo interrogation sessions at SOE, Noor would often freeze up or give away personal information. Her trainers also noted that she often left codebooks out in the open and her ‘fist’ (style of typing keys for Morse code) was quite heavy. In their post-training reports, the trainers mentioned that Khan was clumsy, unsuitable for physical feats and scared of weapons. 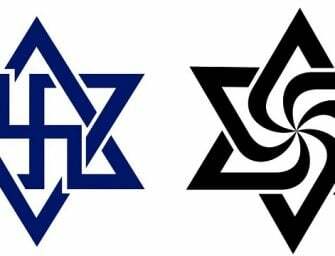 Her strong spiritual beliefs led her superiors to believe that she would not be able to make quick ruthless decisions, as often required in espionage and sabotage work. After receiving this negative feedback, Khan diligently worked to improve her physical fitness, her Morse code skills and also overcame her fear of weapons. Very soon, she was ready for her espionage role and chosen to be sent to Paris as a secret wireless radio operator. Her mission would be very perilous, since she would be the crucial connection between London and the SOE-F section networks in occupied-France. She would have to send and receive messages about planned sabotage operations and enemy movements, without being discovered by the moving detection vans of the Gestapo. 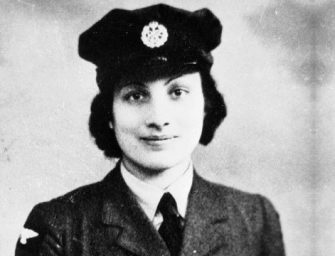 Khan was flown to occupied-France in June 1943, and became the first female radio operator to achieve this distinction. She posed as a children’s nurse, and was given the code name ‘Madeleine’. But the SOE’s mission in Paris was compromised right from the beginning and within a week of Noor’s arrival, the Gestapo arrested almost all the SOE operators in Paris. Noor somehow managed to outwit and escape the Gestapo and thereafter, she was the only SOE undercover radio operator left in Paris. Her superiors in London offered to extract her, but she refused stating that she would carry out her mission by rebuilding the network on her own. Her work over the next few months was extraordinarily brave. In a bid to evade the Gestapo, Khan was always on the move, never staying in one place for a long time. She frequently changed her looks, dyed her hair and lodged with her pre-war friends in Paris to secretly transmit messages to London from her bulky B2 radio set. By single-handedly performing the tasks of six radio operators, Khan enabled the safe delivery of crucial packages and aided in the escape of many Allied forces’ members. The exact cause of Khan’s capture is unclear, but from post-war interrogations of Gestapo officers, it is believed that a suspected double agent, Henri Déricourt, or Renée Garry, the sister of an SOE-F network leader betrayed Khan. When the Gestapo came for her in October 1943, Khan fought tooth and nail with her captors, and six hefty men were needed to arrest her. A few hours after her capture, Khan attempted to escape from her confinement in Paris, but her attempt was foiled. Where she had folded like a pack of cards during her SOE training interrogation sessions, Khan held her own and did not reveal a single piece of true information when grilled by the Gestapo. Just a few weeks later, in November, Khan made a second unsuccessful attempt to escape from her Paris prison. On refusing to sign a declaration that she would not make any further attempts to escape, Khan was taken to Germany as a ‘Night and Fog’ (Disappearance without Trace) prisoner, to be placed in solitary confinement, beaten and fed the smallest of rations. She was kept shackled at her hands and feet for ten months. While Khan steadfastly refused to give up any information to her captors, her spirit was broken and she was often heard sobbing through the night. On 13 September 1944, Khan along with three other fellow agents was transferred to the infamous Dachau concentration camp. While the others were executed immediately upon arrival, Khan was reportedly brutally beaten and tortured yet again, before being executed via a shot in the head. Her last recorded word was ‘Liberté’ (freedom). In October 1946, Noor Inayat Khan’s name was ‘Mentioned in Despatches’. Her commemoration on the FANY memorial in St. Paul’s Church, London made Khan the first Muslim or Asian woman to be accorded such an honour. In 1949, the British government posthumously honoured Khan with the ‘George Cross’ and the French government awarded her a ‘Croix de Guerre’. She is also mentioned on an SOE memorial plaque at Dachau. Additionally, a primary school and a square were named after Khan’s SOE codename ‘Madeleine’ in Suresnes, France. 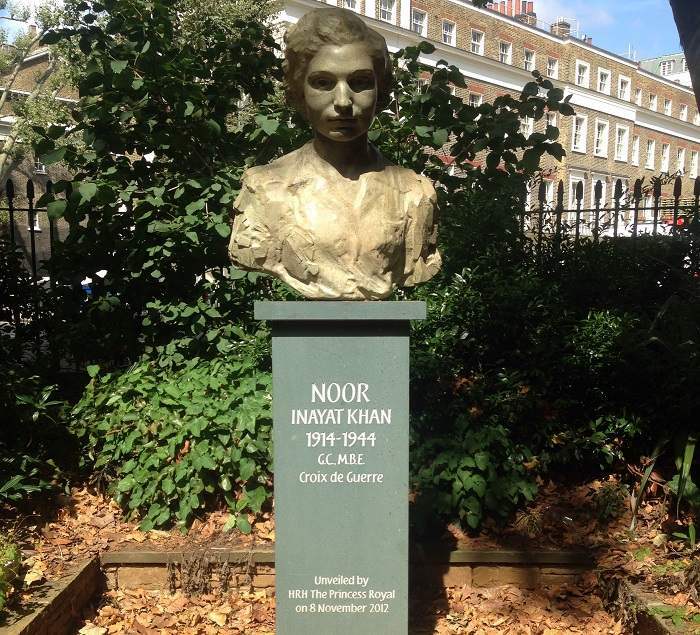 In November 2012, a bronze bust of Khan was unveiled at Gordon Square Gardens in London. In 2014, the British Royal Mail issued a commemorative stamp in honour of Noor Inayat Khan. In February 2019, with the announcement of Khan’s wartime home in London being adorned with a ‘Blue Plaque’, Khan became the first Indian-origin woman to be accorded this rare honour.